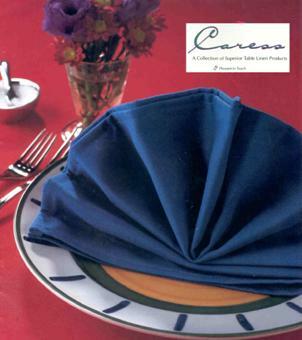 We are the specialists in 'made to order' custom table linen and napkins nationwide. Custom-made table linen for your special function, and have serviced everything from exclusive private properties to the board rooms for the biggest companies across Australia. We also stock an extensive range of standard sizes for commercial laundries, hotels, restaurants and function centres. Host Supplies is the sole stockist of the true MJS Caress in Australia. This MJS product feels better and performs better than any other spun polyester product on the market. When compared to the competitor's ring spun or fillament yarn, the stain release superiority, pilling resistance, color retention advantage, "hand"/feel supremacy and overall customer satisfaction of Caress makes it the logical choice for any rental laundry or high-volume restaurant, hotel or cruise line. Caress is available in black, white or a range of colours. It is a durable This product always looks great whether it is starched or not. We can custom-make tablecloths and napkins to your specific measurements in any of the above fabrics. Class is what Damask represent and Double Damask is the top shelf 100% cotton. This heavy weight Damask with its traditional woven Rose pattern offers a long wearing fabric that is at home in the best of restaurants. Single Damask offers a cost effective and unique woven flower pattern to Double Damask with its traditional woven Rose pattern. If it is 100% cotton that you desire at a productive price, Single Damask is a favorite. At 100% cotton and is a beautifully elegant addition to a table. At traditional fabric for functions or that event requiring a plain sophisticated look. Sateen is 100% cotton and is the same weight and quality as Double Damask, the only difference is that Sateen has no woven pattern. For an industrial or chic look, 100% cotton Mommie is a great choice. Feather Leaf Caress is the perfect choice for easy-care, easy-iron 100% MJS polyester for special occasions. A perfect choice for the formal occasion. Its leafy pattern has made this elegant fabric today’s choice among function managers. Satin Stripe Caress has a formal 2cm stripe throughout the fabric and will set any corporate function apart from the rest.